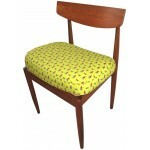 Carefully selected KEY pieces of furniture are revamped and brought back to life by my talented team! Using specific fabric designs to add colour and a contemporary twist to classical form is part of the strategy. 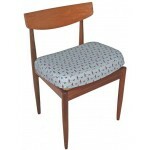 Product info This retro chair has been lovingly restored and upholstered in the striking Do..